March Modeling Madness | Watts Up With That? Is March In The Upper Midwest Losing It’s Freeze? The actual data doesn’t seem to support Climate Central’s recent claim. As you can see below, CO2 has been increasing rather steadily for the last few decades, particularly the last 30 years. No dispute there. If Climate Central’s press release theory were correct, we would expect to have already seen an increase in March temperatures, and an increase in number of years above freezing. Below is a graph of NCDC March temperatures for Wisconsin since 1979. The orange line is the mean and the red line is the freezing line. Note that not only is there no trend towards a warmer March, but the standard deviation is high (3.67) and the range is also large – about 15 degrees difference between the warmest and coldest March. The reason to use 1979 onwards is because Hansen reports his trends from 1979 onwards, CO2 has increased quickly since about then, and that is also when satellite data came on line. 1979 is the year when GISS data turned sharply upwards, so it is a conservative time period to argue the thesis. Even so, the 100 year graph of March temperature in Wisconsin seems rather flat also. The next graph is the number of years above freezing per decade. As you can see, there were fewer years above freezing in the last decade than there were in the 1980s. Minnesota shows the same patterns – no warming and high variability. The number of years above freezing has also decreased. Conclusion: Based on the NCDC data, there is no evidence that increases in CO2 over the last 30 years have affected March temperatures in the north central region of the USA or moved the freeze line north. Once again, we see a case of scientists trusting climate models ahead of reality. Here is Minnesota and Wisconsin with five different trend lines for different start years. April 2, 2010 in Climate data, Forecasting, Modeling. showing some station data – declining number of Marches above *freezing* – climate central is apparently trying to hide the decline. Models trusted above reality. I like that. That is a good way of saying it. Please keep informing the masses of these realitites. Perhaps they will eventually see the light regarding these charlatans. They’re not scientists. Scientist actually do science, these guys are paid to write propaganda pieces. Climate Science is an oxymoron. Models only have a very short lifetime (a bit like politician’s pledges). It’s so easy to predict anything knowing that another model will probably supercede it in time to come. Meanwhile, the model, upon which future funding is often based, has done it’s job. They’re great things really ! There’s no trend line on the graph. How can we tell if there is “no trend towards a warmer March”? Please throw some linear trend lines on the graphs. Thanks. There’s no money to be made with reality. Do you mean to say that reality is bound to catch up with the models, or that models are trusted INSTEAD of reality? Everybody with a basic understanding of science knows that climate models have no validation and thus zero predictive skill. It is amazing that the garbage produced by climate models is actually reported and believed by some. Mind you in the UK our climate modellers can tell what conditions will be like within 25km squares 50 years from now and bureaucrats are already wasting money planning for what is to come. Unbelievable! I said something like this on the last thread concerning the Comedy (oops Climate) Central article. For crying out loud. Even if they could come up with this junk-science, which of the 16 General Circulation Models were used to obtain this summarized computer output? Were the 16 out of 21+ GCMs used by the IPCC chosen based on which produced heating in the central plains of the US? Some of these Bozos (that means clowns) believe that the GCMs can give regional future climate changes, regional warming, cooling, drought, and flooding. What does it mean when 6 models shows warming in the central plains of the US, 6 models show no change, and 4 models show cooling? This is all pure junk-science. Hey boss, what’re we supposed to do with this lunched 2010 Freeze-Line Anomaly? Sorry, Bob, cold surges wiped out all the trends. We tried to save them with heaters and spraying water, but they all froze. Crops are ruined. The Met Office Forecasts 16C warming in the Arctic by the end of the century, so there won’t be a lot of cold air coming to Wisconsin any more. People will be escaping from the desert heat of Chicago to Wisconsin in their tri-hybrid wind/solar/hydrogen powered cars. The data shows a huge year over year variability of 5-15 degrees, so I intentionally left trend lines out of the graphs. Moving the start points by one year drastically effects the calculated trend. For instance, the 1979-2009 trend is negative, and the 1978-2009 trend is positive. The point being that any trend line I generate won’t be statistically significant. The number of years above freezing charts are the most interesting ones. The National Weather Service has made it official. The first 3 months of the year were the coldest ever reported in Miami Beach, Naples, and West Palm Beach, and was among the coldest winters ever for Ft. Lauderdale and Miami. Science is dead. Soon we shall abandon our cities and our clothes, paint ourselves with woad, and gibber at the moon to hold back the glaciers in Greentopia. Steve Goddard (11:52:51) : Then you really can’t say there is no trend. See what Chiefio is finding in his work on GHCN. The effect is to show either artificial warming, or more steeply warming, or both in the “adjusted” charts. I certainly can look at these graphs and say that there is no evidence of either an upwards or downwards trend. The onus is on the people claiming warming to demonstrate the upwards trend, not me. Gore: They call polar bears loons in Minnesota? Gore (to Aide): A bird? That swims? How can they have a waterfowl be the state animal in a place that cold?! Gore (to Audience): Ladies and Gentlemen, it’s worse than we thought. Minnesota has already lost its treasured polar bear population. This is a sad day for planet earth and proof that we have crossed the tipping point. The issue is really about bias. If the average of the output of 16 different climate models showed no geographical reduction in the freezing they would assume something is wrong with the inputs and make necessary adjustments until the computer models tell them what they want. Computer modellers have an inbuilt bias according to Gavin Schmidt and Michael Mann. I’m going Red, blood red, as opposed to green hell. There is no hidden meaning in my going Red. I just like the color blood red rather than green hell. From a longer essay about models (retreadresources.com/blog): We must treat our models as hypotheses. When they fail the smell test, toss them out or re-calibrate and revise. If the re-calibrated model fails to support the thesis then the thesis must be seriously questioned. The most important point here is support. Models are models, they explain and sometimes predict but they do not produce data. Models prove or disprove nothing, indicate is possible, suggest is probably but define or prove impossible. If models did anything more then suggest, every general would win every battle. Models are not and can never be reality, that is a logical impossibility. The best they can do is provide a pale reflection of it. Model results are just information, not measured data. They form part of our information base, they are not knowledge and they can never impart wisdom. Although I’m no ‘climate scientist’ those charts look absolutely average to me. Dah, wheres’s de warming George? I think the term “Scientist” needs to be restricted to refer to only thous who actually employ the “Scientific Method” in there work. I’m from northern Minnesota. March has seen significant warming in the past 115 years, but that peaked during the 1980s. Since, March has been somewhat cooler, and if you single out the 1975-2009 period, the month is cooling at a rate of a half degree fahrenheit per decade. 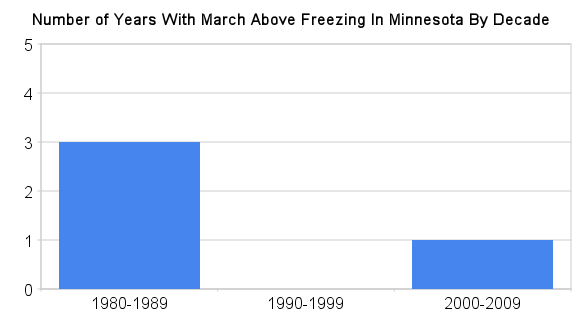 Locally, the only time March was above freezing in recent decades was in 2000. March 1973 was also above freezing. March tends to be warmer than average during El Niño winters. El Niños were particularly common from 1980-2000… of course the number of warm Marches was higher. During the same 1975-2009 period, the month of May has cooled at a rate of 1.56˚F per decade. Will this trend continue? Will May be 15.6˚F colder in 2075 than it was in 1975? Doubtful considering by that point April would be, on average, several degrees warmer than May. May during El Niño years tends to be cooler as the El Niño tends to weaken during this time and the northern jet buckles, sending cool air down from mid-May to mid-June. This is a common feature.. and El Niño is to blame, not CO2 warming. What really drives me crazy is this ‘climate expert’ wannabe did her dissertation on the Little Ice Age. Greenland Ice Cores (1989) clearly show higher CO2. She is a GE/Weather Channel/Obama Socialist and will say anything! I know this does’nt cover the science….but science from her has always been questionable! Show the trend with the CI, hiding the uncertainty is no different than hiding the decline. That’s what hiding the decline was, hiding uncertainty in the data and just talking about it in the text. north dakota, montana… inquiring minds..
Just once, it would be nice to see the Mauna Loa CO2 graph shown with a Y-axis scale that extends down to zero. Of course that wouldn’t fit the narrative of skyrocketing CO2 levels nearly as well. The bulk of the people who would really need this type of information, would be farmers needing to choose whether to plant short or long season hybrids to be able to harvest a good yield ahead of freezing fall temperatures. You cannot fool these farmers they are in the field almost every day, they watch the weather twice a day minimum, some subscribe to satellite coverage, as all of the COOP elevators do. They don’t miss much, and spend most of their time discussing what others saw they didn’t. This is my daily reality in small town NC Kansas, these kinds of crap forecasts we are discussing here, are the first thing to be thrown out when they diverge from reality. They can post to their site what they want, but the bulk of the grass roots farmers won’t be fooled for 30 seconds, about as long as it takes to tarp the grain truck. It truly is a shame what has been done to the data, I think it only effects the monthly averages, as it would be too much work to go back and change all of the daily raw station data. At least i hope they have been lazy enough to have taken the shortcut of just adjusting the monthly averages figuring the general public would not take the time to process the dailies into a monthly average to find out. I am working off a set of raw station data from CD’s printed in 2003, and they agree with the raw station data from several local stations I have checked, from their original hand entered records. Climate Central is a nonprofit, collaborative group of scientists and communicators. Our mission is to create a bridge between the scientific community and the public, providing clear, honest, nonpartisan, and up-to-date information to help people make sound decisions about climate and energy. In short, Climate Central combines sound science and vibrant media to increase public understanding and attention to the climate challenge. 1. What scientific community? Who are the people in this community? Do they mean all people in science? How did they determine who was at the science one end of the bridge? 2, Who are the public? Do they mean the general public? Progressives? Liberals? Politicians? News Media? Who are making sound decisions about climate and energy? 3. What do they mean by honesty? Do they mean fair and balanced? Do they mean unbiased? Do they mean complete? 4. What is vibrant media? 5. What is the climate challenge? I wonder is paying the bill for the staff at Climate Central. They have at least 10 highly paid employees who surely do not work for nothing. Anyone know? It amazes me that WUWT can do so much in inform the public and scientific communities with so little financial support and with a staff of volunteers. It seems an easy way to test models would be to model the past. If your model matches the reality of what was in the past then this would be a pretty good proof of your model standing up in the future. All climate model should use that as a standard. Or am I just being to simple? Bob, one doesn’t need a computer or a calculator to detect a trend–the old eyeball does an acceptable job of seeing correlation or lack thereof. These old eyeballs don’t detect a trend. Do yours? But as Mr. Goddard explained in a previous comment, what deflects any possibility of a trend is demonstrated by the charts that show the number of years above freezing. Was this one an April Fools joke? If the climate models are all inaccurate, what’s the point in the average? Is there no way the alarmists can be taken to court in the US for spreading false, unsubstantiated claims about future climate disaster which will lead, if heeded, to the impoverishment of the nation? British courts are too weak and more and more influenced and controlled by Europe. I, for one, would be prepared to contribute to a fighting fund, if a credible case could be made. I suspect many others who visit this site would contribute if this nonsense could be finally put to rest. The 2010 maps from Cullen et al. clearly show that half of Wisconsin and nearly all of Minnesota still experience an average March temperature of < 0 (using 80s and 90s baseline). So why would we expect to already see "an increase in number of years above freezing"? You're looking for Marches above freezing in areas we already know are below freezing. Yikes. Furthermore, Cullen et al. are considering the % area of each state that is below freezing, not the average of the thermometers. Your analysis disregards the spatial distribution of the temperature readings. When interpolation techniques are applied to point data (commonly referred to as "smearing" on this website), the area-weighting effect may yield a much different result. If at first you don't succed, eh? Take your pick, but I am not going to draw a trend line with that kind of sensitivity to the start point. That screen is moving like a den of rattlesnakes. I’ve always thought that models were supposed to be *based* on reality.. so this makes me think: “*which* reality?”. It doesn’t seem to exist in this universe. Inability to reconstruct the past may prove that the model doesn’t work, but being able to reconstruct the past is not proof that a model as any predictive ability. Only accurate future predictions can demonstrate that a model has accurate predictive ability. So much for CO2 trace trends. Ron McGathy (13:26:37) :It seems an easy way to test models would be to model the past. If your model matches the reality of what was in the past then this would be a pretty good proof of your model standing up in the future. All climate model should use that as a standard. Or am I just being to simple? You are not and they do (although I’m not so sure about these non-Academic centers that produce non-peer reviewed ‘research’. It’s a buyer be aware market, I think the general population has enough savvy to know that they have never been right consistently on the daily forecasts, and will take these longer term forecasts with a bigger grain of salt. Lawsuits for bad forecasting does not hold rain water, following bad forecasts to your own economic doom, is a laughable offense by your farming neighbors, (you believed that stuff?) then they get together and help when they can. Sorry, there was a bug in my spreadsheet from my last post. Here is Minnesota with five different trend lines for different start years. It is comforting in Rhode Island to note the models say they are high and dry. If you still have some battery left in your Blackberry you will note that we can’t believe the weather caster. The flooding picts must be an anomaly. You are confusing trends with absolute numbers. If March was warming in Minnesota and Wisconsin, we would be seeing both an overall warming trend and more years above freezing. We see neither. It should also be obvious with the huge year over year variability, that the fine area sensitivity in the Cullen maps are vastly more precise than they are accurate. Sometimes National Geographic publishes scary pictures of tiny insects magnified about 10,000 times. 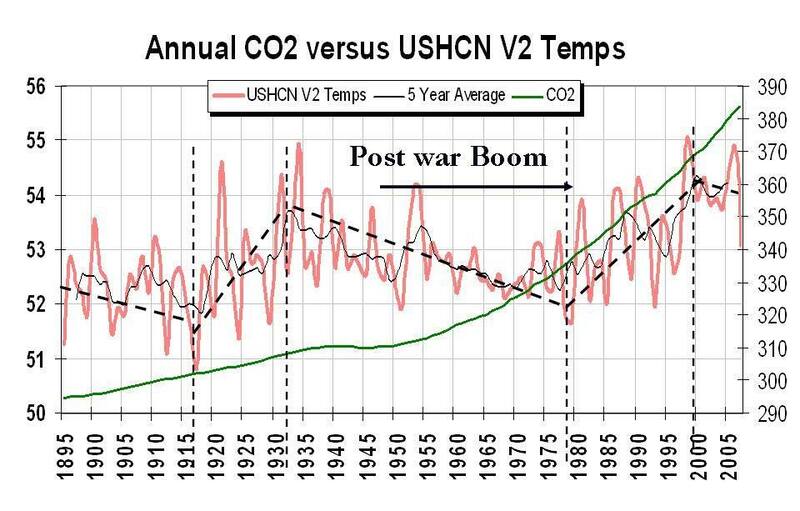 Same effect as the CO2 graphs. I thought some more about your straw man question. You ignored the thesis of this article. Did you do that on purpose, or was it just an oversight? If Climate Central’s press release theory were correct, we would expect to have already seen an increase in March temperatures, and an increase in number of years above freezing. Well, yeah, it’s March, what do you expect? Of course their predictions give us an extra month of growing season in 2090, so we can raise higher yield hybrids. . .
Tsk tsk, I can see Algore using White Bear Lake as proof of the former polar bear population. Kinda hard to explain wolves, bear and even wolverines moving south if it is warming, eh? It’s a shame that modeling gets misused so often. Modeling is at the heart of science as a companion to the experimental mode. Mistaking model output for data is a pretty primitive error, of course, but the lure of either fame or fortune is strong within the human species. Unfortunately, all of science is given a black eye in the general public’s view when even a few misuse their art for whatever reason and are discovered to be less we thought them to be. Disingenuous or incompetent; the cause matters little and the damage is done. Being a scientist does not remove our subjection to human faults. I’ll bet my 2090 Prius against your 2090 Insight over a quarter…….. If the positive trend of +4 °C per century for 1978-2009 is right, the trend has to be more positive for 1979-2009 after the very warm march 1978 is omitted. And it must decrease after removing the cold year 1980. By the way, even without trend line you couldn’t hide the increase: In your diagrams the average 1979-2009 for Minnesota is about 27.5 F, while the 100 year average is only about 26 degrees. Similar for Wisconsin. Smokey, is there no way these people can be accountable for what they are doing? I find it strange that he can keep on with this without any reaction from some authority ? It looks like outright fraud to me? Here are scatter diagrams showing the lack of correlation between March temperature and year. b) the year 2008, with its attendant 0.595C decrease, puts us back to where the temperature was in 1780, the start of the Industrial Revolution? and up to say, 50.000 ppm (about the concentration in the air we breathe out). There are lies, there are statistics, and then there are climatologists. After 60 years of farming, I don’t think I’ll bet the farm on this drivel. This article is mainly about the last 30 years, when CO2 growth has been rapid. There was an increase from about 1948 to 1970, and a decline since – during the period of maximum CO2 growth. The Mauna Loa records don’t even start until the 1960s. If you like longer term records, we also know that March temperatures have increased since the Wisconsinan Glaciation when the region was covered with ice about 4,000 feet thick. And March temperatures have declined dramatically since the Cambrian Era when Wisconsin was a tropical climate. I’m game. The amount of C02 added to the atmosphere (est. 140 ppm) would make the thickness of cellophane if depicted on a graph 10″ high, with 0 ppm at the bottom and 1,000,000 ppm at the top. Grab your micrometer, and open it from 0 to .0014″. Not enough C02 increase to make a skin on a lizard. Let’s start calling this what it really is. It’s not CLIMATOLOGY it is CLIMASTROLOGY. In my forecast based on past patterns you can see the “Normal” pattern that we would have happened with out the planetary influence you got to see first hand. I still have not gotten included a method of reinserting what these influences do to change the “Past data analog” to adjust for the current planetary influences, which is when and where it goes bad. It is kind of like knowing that it is the bullet that kills not the empty gun, while watching the robbers hand shake uncontrollably. Looks like Al Gore has lost a little weight since ClimateGate was exposed to the world . You’d think he’d be a little heavier since he’s been eating all of that crow . After ClimateGates exposure , I read somewhere that German climatologist Hans von Storch now wants to see an Independent institution recalculate the temperature curve, and he even suggests that the Skeptics be involved in the project. He points out, however, that processing the data will take several years. inviting the Skeptics next time around ? Now thats real Science . I agree, no trend for the past 30 years, but a positive trend for the last 100 years (as your average temperatures show). @Charles: If you take UAH temperatures, you see, that there are strong changes caused by natural factors, up to 1 degree C in a quite short time, for example from Aptil 1998 (+0.76 °C) to January 2000 (-0.24 °C) and now back the opposite direction from -0.13 (Mai 2008) to +0.7 (March 2010). So it is difficult to find a small positive or negative long term trend and it doesn’t make much sence to look at a 10 years trend. 10 years trend was negative a couple of months ago, now it is positive, after the next la nina it might become negative again. It’s a blip (don’t watch the man behind the curtain!). Ron *IS* being too simple. Sorry Ron. When you make your model fit the past you are doing curve fitting. Nothing more. A good way to see whetehr you’ve been overfitting your model is to divide your real measurements into two halves. Now make your model fit the first half of the data. This is the training set. Then see whether your model correctly emulates the second half of the data. This is the validation set. I know, the climatologists didn’t do it that way. But it would have been sane. This is what you we really looking for – March temperature vs. CO2 Both states show a slightly negative and statistically insignificant trend. Conclusion: Based on the NCDC data, there is no evidence that increases in CO2 over the last 30 years have affected March temperatures in the north central region of the USA or moved the freeze line north. Thought about it for a moment and I don’t think that validates the model either. We’ve been in a warming trend since the 1700’s with a few cooling trends intermittant through out. So if you consider that we are at the upper end of 300 years of warming, the current conditions actually do merit the term “unprecedented”. With earth radiance increasing with T^4 (amongst other factors) all hindcasting tells us is how well the models simulate the complexity of the environment for that temperature range. Assuming that getting it right makes it valid for a higher temperature range is just a bad assumption in my view. The models predicted less ice, more ocean heat content, more storms, stronger storms and got them all wrong. Those things may have been true for warming from the 1800’s to the 1900’s for example, but clearly are not true for the current temperature range. It will be hard to change the current paradigmas, as always they are kept by the intimate and personal fear of being called a fool. My eyes work just fine, thanks. In fact, to confirm what my ancient eyes told me, I reproduced Steven Goddard’s graph and had EXCEL throw a trend line on it. It turns out that the Wisconsin March Temperature graph from 1979 to 2009 does have a “trend towards a warmer March.” In fact, the trend is 0.13 deg F per decade or 1.3 deg F per century. The two flat lines that Steven threw on the graph must have altered your perception of trend. The linear trend of the data is not dictated by the number of years above freezing, which represents about one third of the data; it’s determined from all of the data. Maybe that sort of warning should be required for all climate related predictions. Sort of like truth in advertising for those seeking to influence politicians and the public. Spreadsheet have trend analysis programs to confirn one’s perceptions. In my earlier reply, Steven, I wasn’t claiming a warming. I disagreed with your comment that there was no trend when you were not presenting a trend line and equation on the graph. In addition to the data, you had two flat lines that represented 32 deg F and the mean temperature of the data. I didn’t care if the trend was positive or negative or flat, Steven; all I wanted to see was a trend line to confirm the statement. BTW, the linear trend for the data in your Wisconsin March Temperature graph is positive, at ~0.13 deg F per decade. The trend you claim in your graph has zero statistical significance. Look at the scatter plot. The rsq value is 0.0014. You are claiming a 0.13 trend in a plot with standard deviation of 3.67. Think about that. Do you believe CO2 is the main driver of temperature? Or even a significant forcing? Is there a series of CO2 data other than the one from Mauna Loa? It is extremely suspicious that practically everyone in the world is relying upon the one and the same data measured on the slope of the active volcano. Volcanoes emit enormous amount of gases, CO2 included. Volcanic activity has been on the rise in recent years. Isn’t it one of the fundamental requirements in experimental science that results must be independently confirmed, and not once but regularly? Give me unadjusted CO2 data measured in Himalayas, in Siberia, and in Antarctic for comparison. 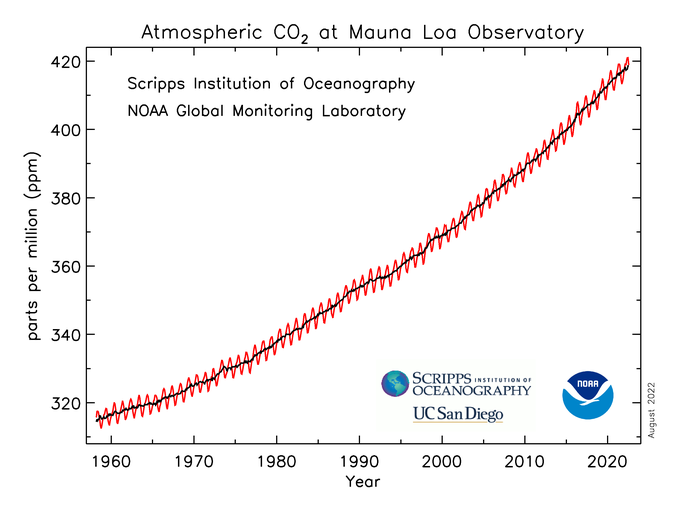 One of the things that strikes me as peculiar is the steady, monotonous increase in CO2 from Mauna Loa. No annual fluctuations from volcanoes, no changes from a global depression in business, no increases from the Chinese rapidly building coal fired power plants. Has anyone ever compared this CO2 graph to petroleum and coal usage? I was taught a long time ago that “nature abhors a straight line.” Somehow, the graph looks artificial to me. That’s all I wanted to see, linear trends on the graphs, when you’re discussing linear trends. 1) We know that regional climate models have a very difficult time capturing temperatures in the Plains even when run for past climate. See NARCCAP (a set of simulations performed over the US for both future and present) simulations http://www.narccap.ucar.edu/results/ncep-results.html. We are talking the models being off between 5-10K in the Northern Great Plains winter months …. don’t be fooled by the scale they use on their contour plots. These points alone should make one reluctant to make a strong claim about a climate regime 80 yrs away. whatever happened to humble hard science? 4. Therefore, 1 temperature data point for New England, close enough. No!? So Climate Central projects New England go from ~75% Freezing March coverage in 2010 to ~20% coverage in 2090. With 1 temperature data point! They must have some astonishing algorithms to model of our stochastic, chaotic climate systems with so little relative data. Ridiculous. No one ‘makes’ the model fit the past. Given the complexity of atmospheric flows that is impossible with only a few tuneable parameters. Models results are compared to the past just as physical theories are compared to experiments. The only real difference being that there is only one ‘experiment’ – the evolution of the real atmosphere. They wont let it die… they have been dis-proven time and time again…. Modeling requires thousands of variable inputs from varying systems and this only goes to prove that it remains woefully inadequate.. The standard deviation is 30 times larger than the trend you claim across the plot (0.39) The linest trend is meaningless, and would have been misleading to have put in the article. The point isn’t in the averaging. The real plan is to use the Texas Sharpshooter Fallacy [shoot a hole in a barn door, then draw a bullseye around it]. I find it amazing that climate data analysis centers keep finding bugs in their analyses. They are so incompetent. Why can’t they be like Microsoft and Apple and eliminate bugs altogether? But I am not claiming linear trends. My claim is that there is no trend. After I claimed there is no trend, people have asked me to prove that by demonstrating a trend. That is a Catch 22. DirkH (16:44:58) :A good way to see whetehr you’ve been overfitting your model is to divide your real measurements into two halves. Now make your model fit the first half of the data. This is the training set. In fact they do. Google ‘climate models training validation set’ and you’ll get a gazillion hits. If you really want justice its much simplier than going to court. We have Heidi “eyecandy” Cullen nominated for the Queen of the eelpout Festival in Walker MN next February. After a delightful day of weighing in what is arguably the most ugly freshwater fish in the Northland Queen Heidi would preside over the traditional KISSING of the Eelpout. Her court would include various local ladies who would consider this great sport, having kissed boyfriends far worse than a fish. My lawyer refers to this as “playground justice” She will swear off global warming forever. Next suggestion! What would your playground justice be? What would Mann, Jones, Connelly and other assorted warmists enjoy in your town? Why do GISS and some other start their temperature record at 1880? Go back two years to 1878 and there is a huge heat spike, was actually hotter than at least one year post 2000. That is what I get when independently processing hadcrut3 gridded. It sure makes a hellava counterpoint to the usual hockey, suddenly there is a bathtub shape. And that is the start. Can anyone dig out the official reason for the choice of 1880? Max did the calculations in old money, (°F, BTU/lbm), I converted to new money, (°C, J/g)! We got the same answer in different forms. Temperature alone was NOT a good indicator of energy. We have virtually no chance of recovering a good energy signature of anything except for those places that have both temperature & humidity records. I assume there are some humidity records from some satellite measurements, so that’s a mere 30 years or so. Start again & do the job properly! Leif called me on my 1st post along the lines of my latest. He asked if I would stick by it if temps dropped. I said then, YES & I say it again. even if average temps drop, it means NOTHING! I might give the AGW alarmists some stick but, at the end of the day, that is my stance. I am not sure whether there is any point in including articles such as this. While I have no problems with the use of computer models, the key test is that they correspond with real measurements, which none of them do. Hence, in any true scientific environment, they are invalid and should be discarded. To pursue these ideas when they do not correspond to reality pushes them in to the area of pseudo-science, like astrology versus astronomy. The perpetrators are not climate scientists, but ‘climatologers’. When we have threads discussing what would happen if these pseudo-scientific models were true then it seems a waste of time. As the models are invalid then anything which uses them is also invalid. Fighting such drivel is like fighting the hydra, cut off one and seven more jump up in their place. These computer models depend on water vapour being a positive reinforcement to CO2 warming, while research suggests water vapour has a negative feedback. 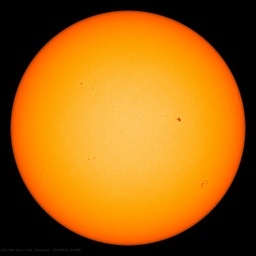 For a doubling of CO2 it is expected that there will be a 0.5C increase in temperature. The only theory I know which fits in with reality is by Miskolczi, who calculates the increase to be 0.48C for a doubling of CO2. Miskolczi also predicts no tropopause warming, in agreement with radio sonde and satellite measurements. I think you are wrong, the models are build in part on past relationships and correlations and with ‘tuning’, not only on physics theory. If the climate models were built on equations based on physics, then all the models would return the same results. They don’t all make the same projections. How accurate are the IPCC projections when compared to actual results?? Didn’t Phil Jones say that there was no significant warming in the past ten years? But the original question was (para phased) if a model can reproduce the past, does that mean the model was a good predictor of the future? And the answer is no. I can show you my race track models, football models and stock market models that have fair R^2’s and very good P values when recreating the past, and they are mostly worthless for the future. LOL. Very interesting that some month do not show any increase (March, September, October, December) and only spring and summer months show pronounced 1960-1985 cooling and warming since. A little OT, but interesting. For those who claim that glacial retreat is evidence of AGW, here’s a link I noticed over on Bishop Hill’s blog. Regarding the Lower Grindelwald Glacier. “The picture of 1777 represents the glacier as no more extensive or more voluminous than I remember it to have been in 1867. Well, every combination of words would do that. I find a lot of junk, Tom, and outdated stuff. Do you have something that you would recommend? How do you define “trend”, Steven? Then you should have clarified your opinion in the post instead of simply stating that there is no trend, especially when there was a trend. The evidence for a huge heat spike in California exists in 1874-1878. I found it in Phil Jones CRU 94 & 99 sets. Such data has to come from the original US Weather Bureau stations, as referred to in the AMS Montly Weather Reviews. I cannot find anything earlier than October 1884 for reference to these stations, and they apparently go back to 1872 or thereabouts. We should ask Phil Jones where he got the US W.B. data from. The only way to effectively save the planet from Oxi-Morons is to appoint Truck Drivers, Butchers, Check-Out Clerks, Cops, Enlisted Personnel in the Armed Forces, Janitors, Window Washers, Postal Workers, X-Ray Techs, Cab Drivers, Newspaper Delivery Specialists, Bar Tenders, Fastfood Cooks, Laundry and Dry Cleaning Techs, School Janitors, Bilge Cleaners, Welders, Forklift Operators, Wal-Mart Shelf Stockers, Bakers, Tinkers, Taylors, amd Candlestick Makers, and the like, to Tenure Boards at Universities and Colleges, High Schools, Middle Schools, Elementary Schools, Kindergardens, and Day Care Centers. Sorry, but it’s the ONLY way! AHHHHHHH… People here that rely on statistics to prove something that’s not provable are deplorable. When the standard deviation SUBSTANTIALLY outweighs whatever best fit line (I refuse to call it a “trend”), you are squeezing blood from a temperature turnip. THERE IS NO VERIFIABLE TREND! GO BACK TO REMEDIAL STATISTICS 98. The operative word in the above line is “verifiable”, by the way. Anybody that’s dealt with real-world applications of statistics would laugh you out of the room on this one. The correct response should be: Let’s wait another couple hundred years (or if we had the data go back another couple hundred years and include that) until we have enough data that whatever best-fit line we come up with doesn’t get us laughed at. Assume for a moment that the temperature population follows a normal distirbution and apply a 2-sigma (1.96) confidence interval and the sampling error ranges +/- 7.2 around the mean. Can your “trend” of 0.017 degrees/decade get any more ridiculous? But here’s the clincher: What if temperature variations in climate arent linear? How can you be sure that they are? Why apply such, then? Is it your intent to extrapolate forward 100 years? You’re saying climate goes in only one direction? How can you possibly justify that? I wonder if Heidi Cullen stops to think how people view her because of her gloom and doom. I made plots of March temperature vs. atmospheric CO2. Both Minnesota and Wisconsin show temperatures declining at a rate of about 7.5C/100ppm. But the trends are not statistically significant. There is no meaningful upwards or downwards trend in upper midwest temperatures over the last few decades. Pascvaks (05:27:51) : The IPCC already DID IT !!! Didn´t you know it? Just check the names, beginning with Lovely and Tender “Patchy”. There was a mild winter this year in that area. So it is capitalizing on low hanging fruit to assert global warming is happening. But the mild winter was from El Nino not co2. If the El Nino does end this year and La Nina does start before next winter comes, as some are predicting, the jet stream (that Pamela mentions, oh, every once in a little while 🙂 ) will bring Arctic air to that area. It will not be mild winter in there because of that. Pascvaks (05:27:51) : The IPCC already DID IT !!! Didn´t you know it? Just check the names, beginning with Lovely and Tender “Patchy”. No they didn’t! That’s my point. “Patchy” would have been scratched on the first cut by the “New” Board. The people who “APPROVED” Patchy are the same ones who blessed the UN General Secretary, and the Department and Cabinet chiefs of every Western government. Inbreeding tells! We need new blood. Not only if the earth goes into la Nina will the recent warming not mean anything but also if it goes into another Little Ice Age that lasts for decades. Our arguments over trends, and statistical significance, of the last 10 years, or 15, or 30, or 150, won’t mean much. But I think most people here already know that. Heidi Cullen should also know that. If she does know it then she must have some ulterior motive for not bringing it up. If she doesn’t know then how did she rise so high at The Weather Channel? The same for Jim Cantore. I don’t disagree but my point was that you seem to overestimate the power of a relatively small number of tuneable parameters when the observed flow one is trying to reproduce is complex. This can be illustrated using a simpler example, a computational model of turbulent flow in a pipe which involves a single tuneable parameter, p, where, p, is a number. Suppose computations are performed with different values of the parameter and that the best approximation to the observed three-dimensional mean flow is obtained when p=P. In other words computational mean flow V_c(x,y,z,p) that best approximates the observed mean flow V_(x,y,z) is V_c(x,y,z,P). You seem to think that producing a good approximation is not particularly meaningful. You are wrong. It is a VERY big deal. Varying a single number to reproduce a three-dimensional field is next to impossible unless a LOT of the physics is already built into the model. If I lower my sights and only seek to reproduce the AVERAGE flow through the pipe (i.e. forget about how mean flow varies within the pipe.) Now I only have to choose p so that the computational output U_c(p), a number, matches U, the observed average, another number. In this case you are right, the procedure is worthless. The ability to match says nothing about the quality of the model since a match is all but guaranteed (under a few rather weak constraints). Just more evidence that the models are broken and shouldn’t be relied on for policy decisions. What are you nuts? Models are right the real world data is wrong. When in doubt believe the models. The reason GCMs run over climatic time-scales come under severe, well-deserved criticism is because of the outlandish claims made about their ability to simulate physical reality and predict the future of a chaotic process. Modelers in other fields involving fluid thermodynamics make no such claims! One last graph just to confirm what everyone knows anyway, comparing the two (with the snow cover inverted and scaled), it’s obvious the two are interrelated (correlation = -0.7). Temperature goes up, snow cover drops. Looks like the two years with the most snow cover (1973 and 2000) were also the two warmest years. Look again at the title block. The Snow Cover data is inverted. What’s the data for Montana, Washington, Upper New York, New Hampshire? Might as well show the whole set, eh?? Here are all the Northern States from west to east. No March upwards trend anywhere. ERRRrrr, I am in the middle of North Carolina on March 17th (chosen at random) the low was 30F. I was planning to plant grass in February per the USDA extension guidelines but could not because of the snow cover…..
Just to illustrate the uncertainties in science and the use of computer models take a look at this recent event and please don’t be having food or drink in your mouths.